For many, summer is a passport out of the hot confines of the kitchen and into the territory of the outside grill. Celebrate the change of scenery by taking advantage of nature's delicious bounty. Kabobs: Thread skewers with thick slices of tempeh, tofu, or firm-fleshed fish such as monkfish. Alternate with cherry tomatoes, zucchini, eggplant, mushrooms, onions, or peppers. Marinate with equal parts olive oil, soy sauce, lime juice, and maple syrup, and add a dash of mustard, salt, pepper, and some fresh rosemary. Portobello burger: This large member of the mushroom family makes an ideal stand-in for the typical hamburger fare. Use your favorite marinade or simply brush with olive oil and seasonings, then place on the grill until tender. Top with the usual suspects: freshly sliced tomatoes, lettuce, onion, and pickle. Salmon and corn-on-the-cob: Place salmon fillets in aluminum foil, coat with olive oil, lemon juice, and salt and pepper or your own concoction. Close up the foil package and place over the heat source. Corn-on-the-cob makes a tasty side dish. Preboil the corn and then place directly on the grill. Spice lovers may want to coat the cobs with chili powder or Cajun spice prior to cooking. Dessert: Raid the fruit bowl when heading out to the grill. Peaches, pineapple, apples, and chunks of mango grilled on a kebab with a dash of maple syrup can be tossed with yogurt or sour cream for a truly original fruit salad. Grill thin cuts of lean meats, poultry, or fish (you might like to try some organic varieties). Quickly sear food and don’t place it too close to the heat. Consume large amounts of green vegetables. The chlorophyll in vegetables binds with carcinogens during digestion and helps to limit absorption. So, haul out your barbeque along with a healthy serving of greens. 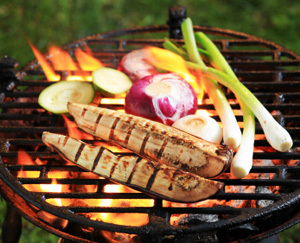 Opt for a gas grill or natural wood briquettes instead of charcoal (and omit the lighter fluid, which contains high levels of volatile organic compounds that can cause smog). In short, when it comes to healthy outdoor eating, think lean protein with lots of vegetables and fruits. Grill on low heat, but as quickly and thoroughly as possible. Follow these tips to enjoy healthy and fabulous food all summer long. Kathleen Finn is a freelance writer and marketing consultant in the natural health industry. She wishes the barbeque season was a much longer one.